Since 1909 Hütter has been specialized in development, production and sales of Personal Protective Equipment. The company is characterized by its innovative products that offer technical and commercial benefits to its customers. The fall protection equipment of Hütter is of supreme quality and price and provides the user with the security and ease of use required to work safely at heights. Hütter Safety is your supplier, consultant, manufacturer and reliable partner for fall protection and Personal Protective Equipment. The Scope Multi Intermediate is a cable support used at specific intervals. Due to the design the Shuttle can easily slide over the intermediates without disconnecting from the line. The Scope Shuttle is designed to slide optimally along the line system with the intermediates. 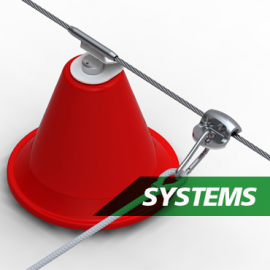 The Scope ECO Dynamic Anchor Post is a more economical solution for line systems on flat roofs making use of the Scope technology and the standard Scope line components. The Scope Multi Intermediate 45º is a cable support used in corners with a radius of 45º degrees. The Scope Dynamic Anchor Post (DP), line systems can be installed (almost) on any roof types and weak roof structures. The conical shape provides maximum energy absorption, through the deformation of the cone together with simultaneous tipping over of the anchor post and the activation of internal damper. The Scope Multi Intermediate 90º is a cable support used on sharp corners. WHY CHOOSE FOR HÜTTER SAFETY? For the reliable performance of all its innovative products with unique features in the market. 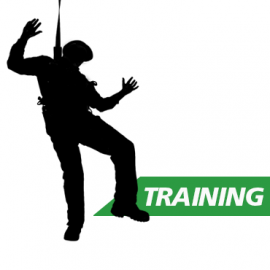 For its commitment to instruct with respect to the proper use of equipment and improve safety in the workplace.